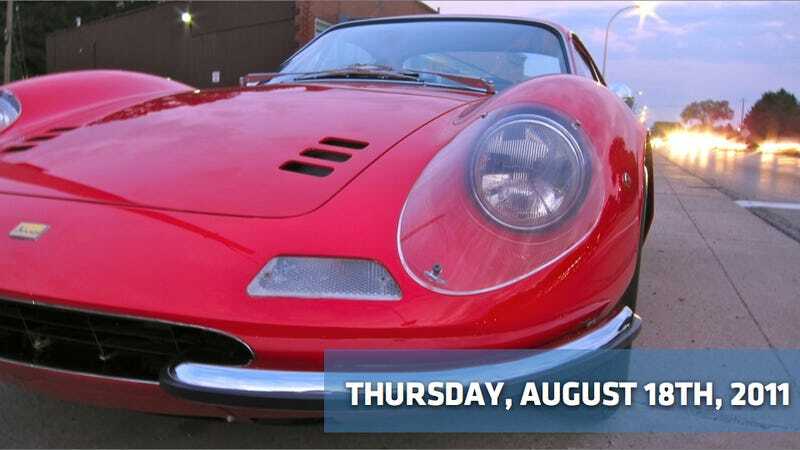 1st Gear: Come To Jalopnik's Woodward Dream Cruise Meetup Tomorrow! The Woodward Dream Cruise is Saturday, and as we've done at Jalopnik in years past, we'll have an official "Jalopnik Staff Car" to cruise down Metro Detroit's M-1. In year's past we've had a "Bumblebee" Camaro and the GT500KR from the new-and-recently-departed "Knight Rider" re-make. This year we've got another car with movie star pedigree. You might see it yourself on Saturday, but if you want to see it unveiled in person a day early — and get a Jalopnik bumper sticker to boot — come out for a Jalopnik Detroit meetup tomorrow, Friday at 7:45 PM, atop the South Lafayette parking garage in Royal Oak. The first 25 people to come out and Facebook/tweet/post to forums pics of the car get a free Jalopnik bumper sticker. Plus, I'll be there! We even created a Facebook event page. What started out as a way to honor a hometown hero and boost interest in a county fair became a Guinness World Record on Wednesday as 298 Cadillacs from across the United States and Canada stretched for nearly a mile in a parade to open the Orleans County Fair in Barton, Vermont. The parade beats the last world record of 275 Cadillacs in one line set by visitors attending the opening "early bird" dinner at the first Cracker Barrel outside of Boca Raton in 1994. 3rd Gear: Car Sales To Slump In Second Half Of 2011 In May, many analysts believed sales would reach a healthy 13.5 million this year - halfway between their peak in 2005 and their 30-year low in 2009. Now, such forecasts seem overly optimistic. Analysts say the swoon in financial markets and economic uncertainty could reduce auto sales by a few percentage points, shrink earnings and delay hiring in an industry that has been a recent leader in job creation. SsangYong released teaser images today of a new compact crossover concept the South Koreans plan to unveil at next month's Frankfurt Auto Show. It's called the Concept XUV 1 and it's supposedly a preview of SsangYong's new design language. Right. Well, bully for them. The Detroit News reports this morning that General Motors says a class-action suit complaining that GM fixed rear-end problems on police versions of 2007-08 Impalas, but not those owned by some 400,000 other drivers, should be thrown out. The Detroit automaker said in court papers that it cannot be held liable for damages relating to vehicles produced before the "new" GM was created after the "old" GM filed for bankruptcy in 2009, as part of a $49.5 billion government bailout. The suit filed by a Pennsylvania Impala owner in U.S. District Court in Detroit in June should be thrown out because it attempts "to hold new GM responsible for old GM's liabilities," GM lawyer Benjamin Jeffers said in a court filing. Bloomberg reports that Maserati, based in Modena, Italy, still plans to build its first sport-utility vehicle at Chrysler Group LLC's Jefferson North assembly plant, said a person familiar with the matter. A concept version of the model, which will be based on the Jeep Grand Cherokee, is due to be unveiled at next month's Frankfurt Motor Show, said the person, who declined to be identified before the official announcement. The imported-from-Detroit Maserati SUV is a product of the integration between Fiat and Chrysler. Sergio Marchionne, who runs both carmakers, aims to expand Maserati and sister brand Alfa Romeo by drawing on Fiat and Chrysler's combined size to boost profit. The strategy mimics Volkswagen AG's blend of volume brands and high-margin luxury nameplates that's helped Audi generate more than 40% of the group's earnings from less than 20% of sales. We just hope it's less of a flop than the last Maserati/Chrysler tie-up. We still shudder about that one.